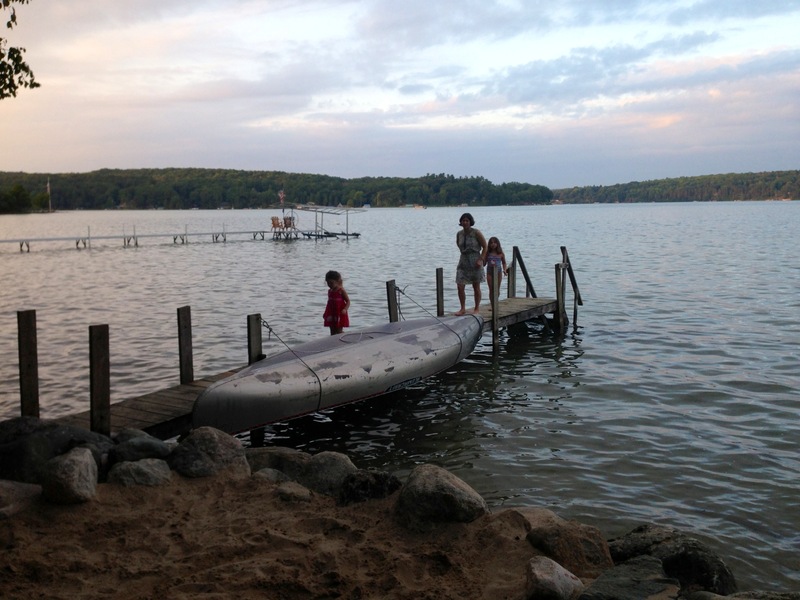 No, Lily hadn’t just awoken from a nightmare; instead, she’d spent the day at her grandparents’ cottage in Irish Hills – and watched as her mom, her 4 year old sister, and her uncle got tossed out of a canoe and into the lake. I’m not sure why or how it happened. The kids had been taking canoe rides with one or two of the adults for a while at that point; 7 year old Lily was paddling a red kayak around the dock, learning how to steer it; and Neve was campaigning hard for one more pass in the canoe, though her 4 year old cousin Kara backed out at the last minute because the wobbly vessel made her nervous. Joe begged off, having just taken kids out onto the water two or three times, so my brother-in-law Chris volunteered to steer in back, while I oared up in front. Neve settled on the seat in the middle. After a few minutes of paddling out onto the lake – Sunday’s slow-forming storm clouds had started to gather, and the wind was picking up – Neve said she wanted to go back, so we turned and headed back toward the dock.